Designed for smaller screens, the new real-money no-app-required mobile online poker service features tap-and-swipe controls and players can login through a standard browser utilizing their Apple or Android-enabled smartphone or tablet computer. “The new real-money mobile poker room has all the same incredible features that have made the poker rooms so popular online but optimized for on-the-go poker play,” read a joint statement from the Horizon Poker Network sites. Intertops Poker and Juicy Stakes declared that they welcome players ‘from anywhere in the world’ and send special competition winners to some of the planet’s most exotic locations to take part in big-money poker tournaments. They are currently hosting daily online satellites for the chance to bag a prize package into next month’s European Poker Championship from Velden, Austria, worth $4,500. “I like the eight-handed tables a lot,” said Intertops Poker-sponsored professional poker player Tim O’Keefe. “It's only a slight change of pace but it speeds up the action nicely. More action and more hands per hour equal more fun and more money. 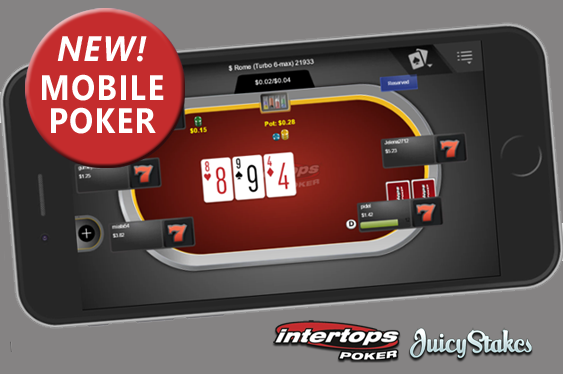 Android and Apple-friendly innovation from Juicy Stakes and Intertops Poker can be accessed via sites’ standard browsers.